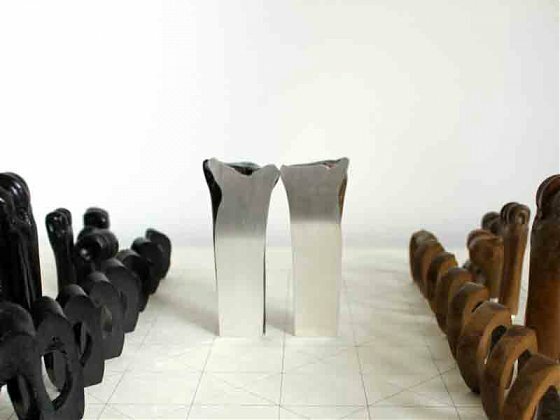 The Tidal Ossuary chess set is the natural continuation of Lohmann and Grundmann’s successful series of vessels made from found bones. Collected from the banks of London’s River Thames, the animal bones are the detritus of a previous era. Deemed of no further use, value or merit they had been cast away only to be turned by Lohmann and Grundmann into beautiful and luxurious objects of worth once again. The designers have made earned a reputation for their investigations into the potential of all materials – from preserved sheep’s stomachs, to seaweed and soap. Always with a view to minimising waste and maximising longevity, their work is a reminder that there is beauty to be found in the overlooked and undervalued.